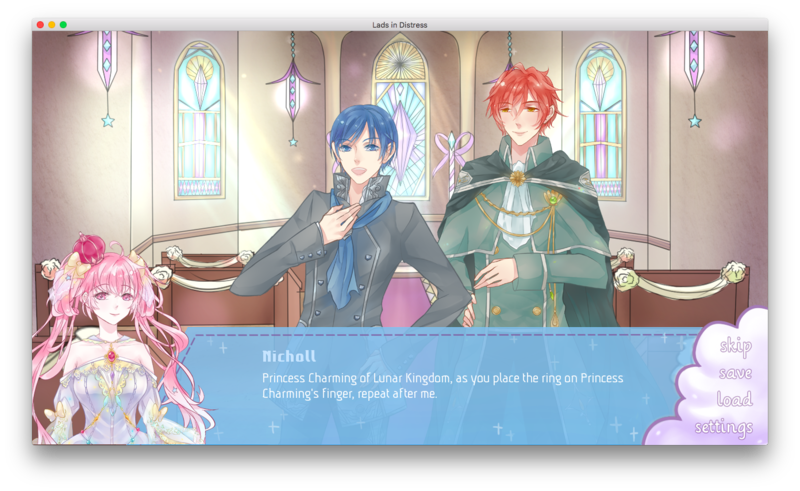 The story starts with our protagonist, Princess Charming, receiving a notice from the King and Queen saying that she must choose an affluent noble from an upcoming ball to marry, in order to save their Kingdom. Yes. The Princess, at the tender age of 18 (oh, sweet, sweet 18), must marry, and there are no other alternatives. The Kingdom is in a difficult situation, and only the Princess’ marriage to an eligible bachelor can save the kingdom from ruin. But I digress. Similar or not to the Barbie movie, I still think it’s a great premise. Plus, when I saw the three princes that were going to join the ball, I got a brief Pokemon-inspired moment. But there’s a twist. These princes, who seem awfully interesting? There’s something… bad about them. So bad, in fact, that you can’t approach them. Even if they’re in a ball where you’re meant to find your future husband and potential savior. Nope. So how’s that ball coming along? The protagonist in this story, the princess of Lunar Kingdom. She’s not your typical, damsel-in-disgress kind of princess, which is pretty obvious, considering the title. As a matter of fact, she dreams of finding a prince to save, which is quite the total opposite. Once she’s made up her mind, though, there’s no going back, even if her decisions may seem to be… err, not so sound. I honestly don’t know if I am to admire her resolve, or to be disappointed by her almost childish stubbornness. Charming’s best friend, who has been with her ever since they were babies. He kinda irritates me, too. Well, to be honest, he does remind me of Julian from the Princess and the Pauper, and that guy there irritated me too. Oh well. But hey, the main reason why I don’t like Nicholl that much, is that he was the one who invited the three “dangerous” princes, just to add life to the party. I don’t even know if this guy is an obtainable, to be honest. Is he? The Prince of the Water Kingdom. Rumor has it that he traded his voice and memories for something more useful to him. He’s also the most interesting one for me, mainly because… well, as an aspiring mermaid (it was my childhood dream! Hahaha), of course I’m going to be interested in the prince of the Water Kingdom. Okay, just kidding. But… okay, maybe not. Hahaha. When I first saw him at the ball, though, this quiet yet kind-looking prince, my interest was immediately piqued. Oh, and when he wrote on the princess’s palm after the dance, aww, I knew he was the one for me—ahem, I mean Charming. That said, it was kind of sad that I didn’t get to know anything about his personality, since he literally couldn’t say a word. That’s why I decided to go for his route first! And you know… it was totally an awesome route, filled with secrets and exciting twists! Can’t say the same about the ending though. So, just a warning: if you decide to take on Mer’s route… let’s just say it will be one heck of a roller-coaster ride. A prince with silvery hair and startlingly blue eyes, from one of the biggest and richest kingdoms. Unlike Prince Mer though, he’s no crown prince. As a matter of fact, he needs Charming more than she needs him, as she’s his last ticket back to being the next King. Charming’s parents warn her not to approach this guy, as he’s apparently a “skirt-chaser”, as they so subtly put it, but of course, this does not deter our princess from choosing him as her husband. I have to say, though, that while Prince Snow did fascinate me at the start, I quickly lost interest (at the start as well! ), as he’s too much of a smooth-talker for my tastes. I simply don’t find myself attracted to guys who feel the need to compliment every single thing about a girl upon their first meeting. Flirting way too much, are we? Nevertheless, I did go after him, after going after both Mer and Zel. Unexpectedly, I enjoyed it a lot. Actually, I’m embarrassed to admit this, but he may be the most eligible obtainable for me—I mean, Charming, realistically speaking. 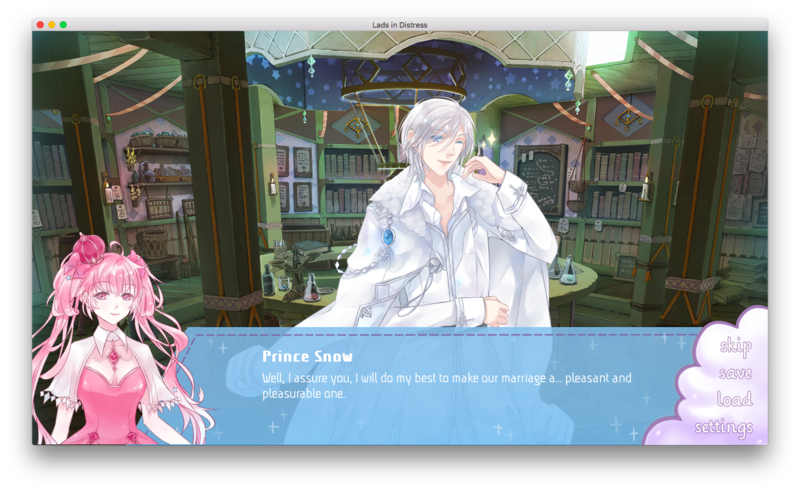 And after going through his route, he may even be my favorite, after all. Hmm. I don’t want to spoil anything for you guys, but let’s just say that while I don’t like excessive flirts, I detest liars even more. Period. The crown prince of the Forest Kingdom, who was kidnapped by an evil witch many years ago, throwing the kingdom into chaos. According to a poem, he is currently holed away in a tower somewhere, waiting for someone to save him. And of course, who else to save him than our feisty princess, Charming? Let’s forget that we literally have no idea whether this guy is still alive. Yep. Remember, the reason why Charming has to marry a guy is because her kingdom is in poverty. So it must be logical to go after a guy who’s been missing for years, aiming to save him, not caring whether or not your own kingdom will benefit from such a quest. Yep. Sarcasm aside, I actually went for Zel after I finished Mer’s route, simply because I wasn’t too thrilled to take on Snow’s route. Hahaha. And what do you know, it was just as awesome as the other two. Zel is an absolute sweetie, and it’s a piece of cake to make him smile. D’awww. 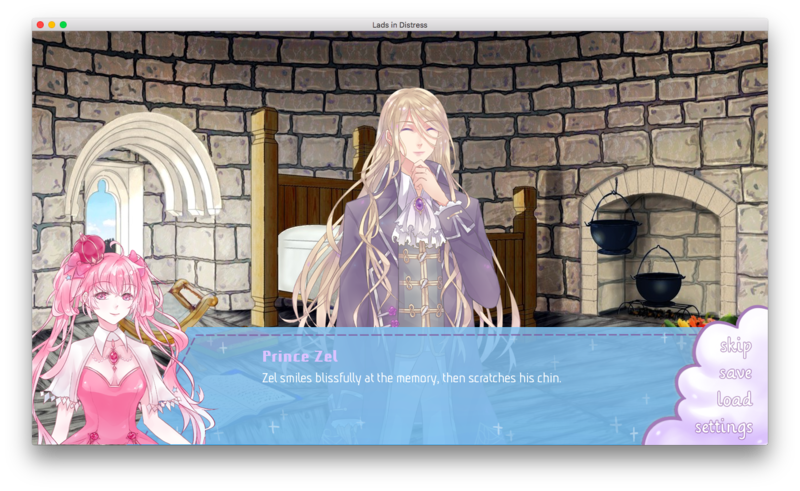 However, it was quite frustrating at the start since Prince Zel simply didn’t want to leave his tower. Why, dear Zel, why?! The writing is fantastic. There’s a mystical tone to the writing, considering that it is largely based on a fairytale after all, and I greatly enjoyed it because of that. I didn’t really notice a lot of whatsoever, be it a typo or a spelling mistake. There are a few mistakes here and there, but they were mostly in the latter parts of the routes, which I suppose was not as tested as the earlier parts. But for the most part, it was really great! I enjoyed both the descriptions and the dialogues alike. The art absolutely bedazzled me, within the first few seconds of the game. That’s because the first background that I saw was absolutely gorgeous. Take a look at this. However, the background art varies, and I mean varies, in quality. Correct me if I’m wrong, but some of them even appear to be freeware? Because I think I’ve seen some of them someplace else before. As for the sprites, they were all drawn pretty well. The anatomy of the sprites felt rather wrong, as they all seemed to be way too thin, thinner than the average proportions, but they were still pretty good. I can’t say the same for the coloring, though! Don’t get me wrong, the coloring was really good too, but whoever thought of the color scheme of the in-game sprites must’ve been going through something difficult, because the color combinations are absolutely… NO. Especially the princess’s sprite. Whoever thought that having an ALL PINK princess would look good was totally nuts. Gaaaah. 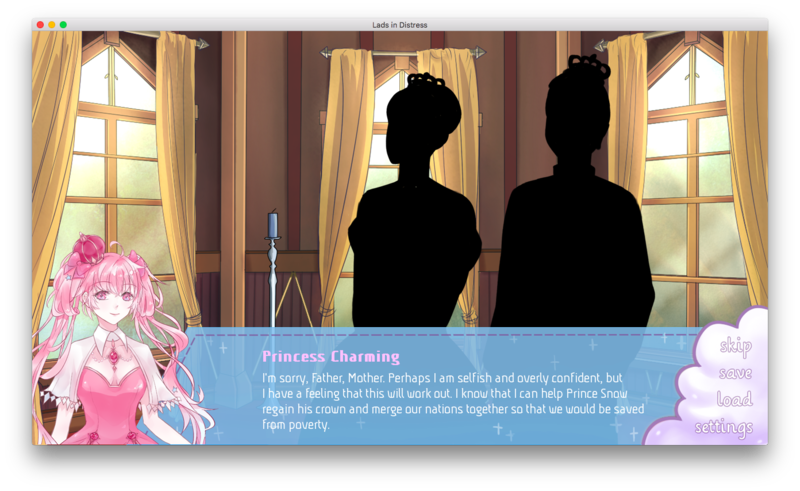 Her sprite reminds me of the online visual novel Skights, though I personally liked that other game’s art style better. I mean, seriously. Even Princess Charming’s skin here looked pink! Colorist/s, what the heck were you thinking?! 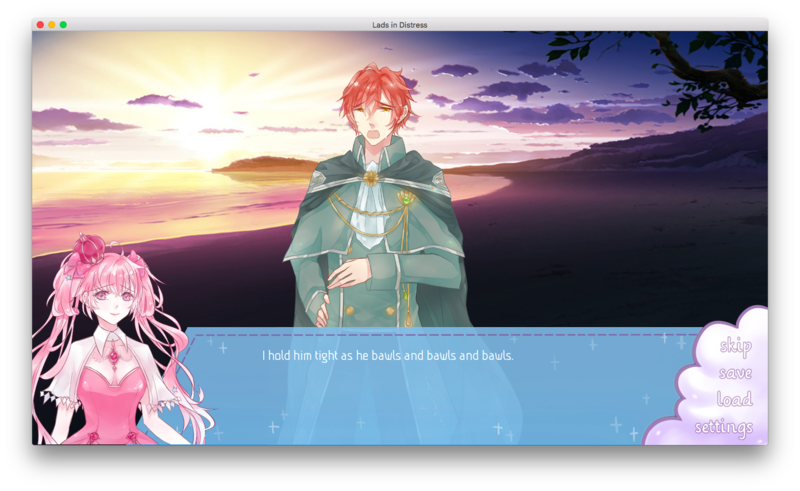 As for the CGs, well, they don’t match the sprites that much, not in the style, and not even in quality. It’s definitely not as well done as the other art assets, but still not bad. 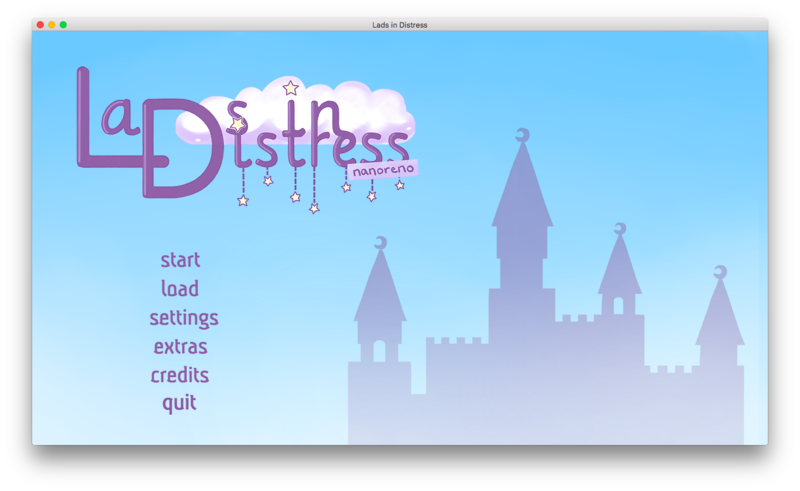 The GUI here is customized, in a pretty cutesy way. Blue and pink are my absolute favorite colors, so I’m sorry for showing a little bias here. However, I don’t like the font very much, as I think it’s a little it hard to read. Or maybe it’s just me. The music seems pretty good. It's decent, at the very least. Hahaha, but sorry, I was actually too engrossed in the story to notice. Apparently, there will be a final polished version of the game, which will be almost triple in length. And I’d like to say that I’m absolutely thrilled to hear that! I’ll be waiting for the full game. 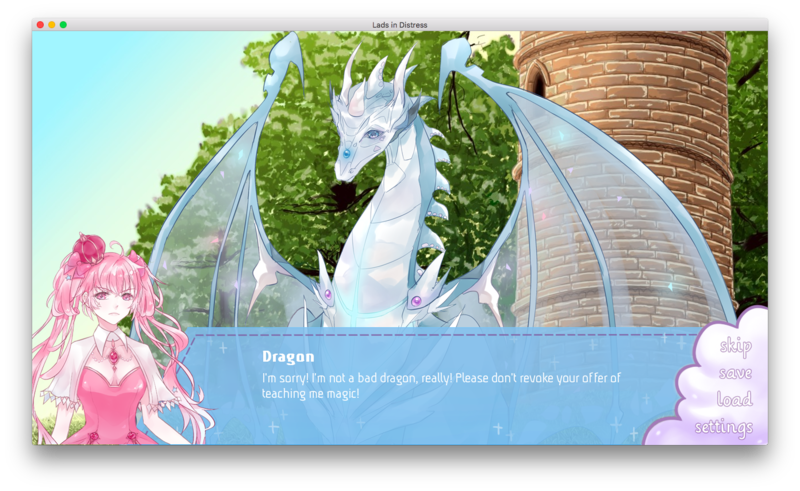 As of now, though, we all have no choice but to make do with this shorter NaNoRenO version. Oh well. A walkthrough is also available here. Thanks, devs!